There were some easy clues here, though, weren’t there? It was a pleasure not to feel stupid and incompetent for once, as words like CYST appeared (‘Lucy Stoner secures a home for dominant organism’ – hidden) accompanied by DORS (‘mocks antique dodo half forgotten by eminent scientists’ – DO[do] + R[oyal] S[ociety]), PIE (‘chattering bird from island in Peru’ – I in PE) and URSA (‘collection of stars is restrained by our sanity’ – hidden). We did wonder whether our C was going to be the speed of light and whether Stick Insect had managed to race off a crossword about neutrinos going even faster and get it published without the current Listener 7-month queue (though a CERN friend, who worked on the original GPS timing circuits involved in the measurements of the aberrant neutrinos, assures us that the time it took to feed the neutrinos into the system accounts for that anomaly there has been such a fuss about). Before dinner, we had our twenty clashes and a full grid. We stared at it for a while and the physicist numpty muttered about ‘hot’ and ‘cold’ but we put our full grid on one side as the Alps have had a metre of fresh snow and even our little ski resort is opening in the morning. An early start is called for. Coming off the slopes rather cold and leaping into the hot tub set the neurons moving; ‘Maxwell’s Demon’ appeared with a DOOR neatly situated in the centre of the grid. 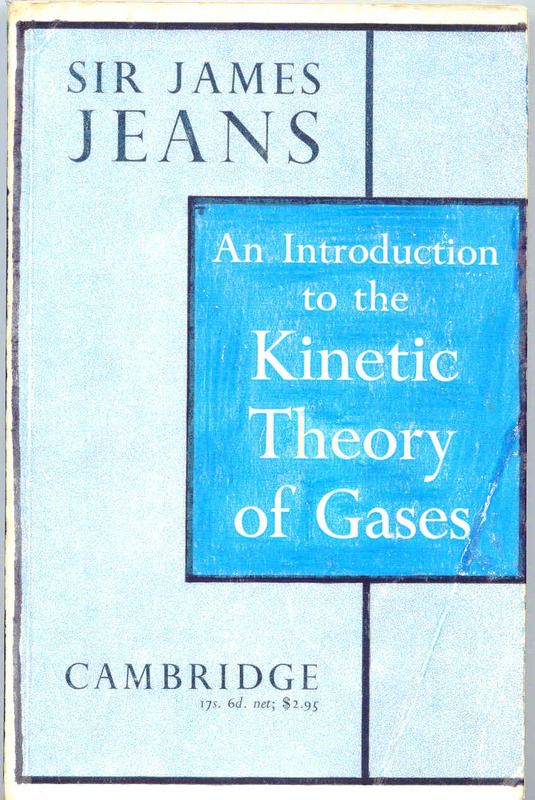 In response to my total incomprehension, the physicist numpty produced his well-thumbed ‘An Introduction to the Kinetic Theory of Gases’, Sir James Jeans, CUP, 1962 (just 17s 6d!) and there it was, clearly explained. So yet again, a Listener crossword proves to be a learning experience (and this wasn’t quite as difficult to grasp as the Klein Bottle theory!) so it remained to decide which side had to have the warmer particles in it – the H – HEAT appeared on the right (once I had chopped up my original grid and sellotaped it back together with RPRINCIPLEACCELERATO and OFTHEWEDGETHETHINEND producing ‘The thin end of the wedge’ and ‘Accelerator principle’) so I happily put the Hs there and the Cs on the other side. Many thanks again, Stick Insect for an entertaining puzzle that was not too challenging and that left us some of the weekend for gardening, cleaning, ironing .. Oh dear! Stick Insect’s second Listener, his/her first being with the theme of Henry VIII and his wives. Here we had a “Right and Left” grid, with the interesting difference that the join was made by two entries across the middle of the grids. There were twenty clashes to be found (grrr!) to illustrate the success of a potential lawbreaker. 1ac was straightforward, leading to AFAR and ASPS. I decided to enter AFAR on the left and ASPS on the right, a 50-50 chance of being correct (and as it was to turn out, I was). 4dn came next, and was also easy: POMADE and ESTEEM. I was faced with the same left/right problem of course, and decided to deviate from my initial run through all the clues and work my way from the top lefts down to the bottom rights. 1dn ASCI and AIDE was followed by 2dn FIANCHETTI and something else. 9ac SILENI/INSTAR came next, and it seemed that ESTEEM would go on the left side since 4dn was more likely to be EN•••/PA••• than EA•••/PN•••. Indeed, they were ENIAC and PATTE. At this stage, I could still have been wrong about which side was which, but until the two entries at 14ac were solved, it didn’t really matter. It was still vaguely possible that some of this positioning could be wrong if clashes were involved, but I ploughed on regardless. The first two clashes that I got were SHAH crossing ACNED and ECU. Both were C/H clashes, and I wondered if they all would be. Indeed, would all Cs cross with all Hs? If so, 1dn ASCI would lead to 11ac beginning with H and yes, it was HASHING. And that second H would mean 3dn began REC … RECITER. I was on a roll, and it meant that the clues became that much easier. The central two entries were still a bit tricky: Relationship of sales to investment shown by amending price ratio per cell can transform hen feed to get hen with density — small start for a significant development (20, two words; 20, six words). It seemed obvious that the first half was an anagram of price ratio per cell can and the second was an anagram of hen feed to get hen with D. It needed a bit of untangling to finally get THE THIN END OF THE WEDGE and ACCELERATOR PRINCIPLE. a somewhat racy joke being frowned on, with the break between the clues being East / German! All that was left was to find the lawbreaker. I soon got PATTEN and wondered what George Patten had done during the World War II. As George S Patten, he would have the requisite 13 letters, but I couldn’t find George anywhere in the grid. DEAR and UPON in the seventh row also had me thinking, but they were also soon discarded. Surprisingly, it didn’t take too much long to identify the culprit. I’m sure there are many of you who took a lot longer than my twenty or so minutes. 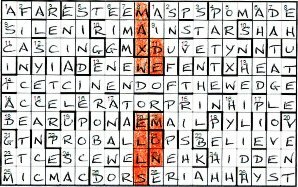 Down the rightmost column of the left-hand grid I saw MAXW••ELL, broken by the two central rows. 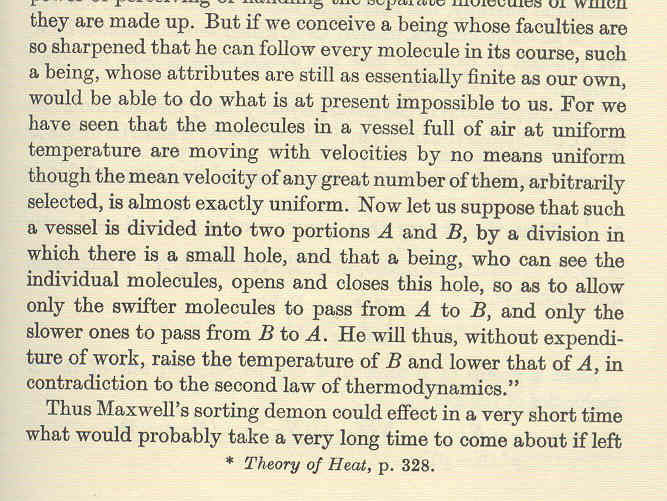 The only reference that we were given at the end of the preamble was Chambers, so a quick check, and I found Maxwell’s Demon, an imaginary demon who, by opening and closing a tiny door between two volumes of gas, suggests the possibility of concentrating slower molecules in one volume and faster in the other, thus breaking the second law of thermodynamics. The DEMON was completed in the adjacent column, again broken by the two central rows. And there in those two central rows could be seen the letters DOOR. The preamble finishes with the words “one entry shows which side is which”, and at 13ac, HEAT indicated that the right-hand grid contained all the Hot molecules, while the left-hand one contained the Colder ones. 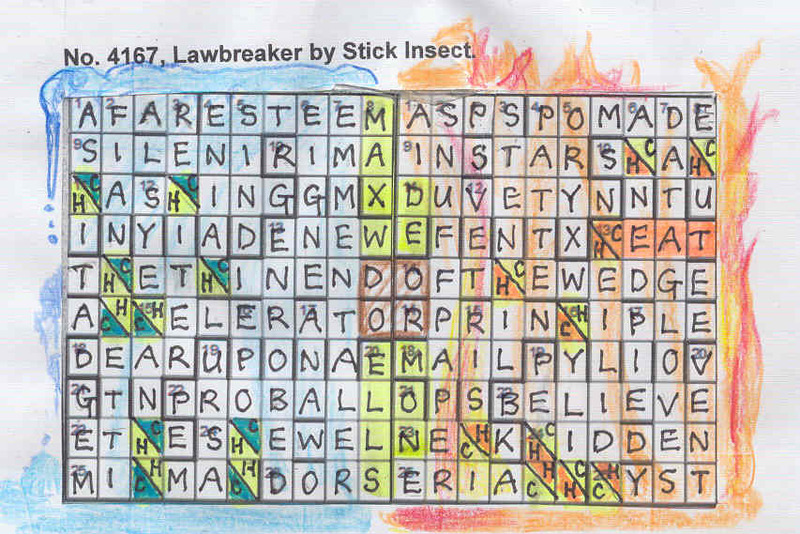 A very entertaining puzzle from Stick Insect with a nice idea and a cleverly constructed grid. Hopefully nobody was fooled by the non-contiguous demon that had to be found. Finally, November saw this year’s outing for Schadenfreude, and we were greeted by a square grid that had an extra cell protruding from each side. Plus there were nine completely barred off squares on the main northwest-southeast diagonal. Upon reading the preamble, we discovered that thirty-seven (37) entries were to be written in reverse, and 22 (twenty-two) had a letter removed and the remainder jumbled to form the entry. Since there were sixty-two clues in total, there must be at least three normal ones, but probably many more since some entries would be both jumbled after the removal of a letter, and entered in reverse (ie backwards or upwards). So, on with the puzzle, and, as to be expected with Schadenfreude, some tough clues. I had a bit of déjà vu with 2ac ROAD HOGS, reminding me of 7dn in the previous week’s Nibor puzzle, MR TOAD. (In fact, as I penned this blog, I had the worrying feeling that I’d already blogged these clues!) 12ac was ZYMOTIC, and I wondered whether going through all the clues once in a first pass was the right way to attack them. I sidetracked to 1dn ARM which confirmed that both 2ac and 12ac were entered in reverse. I solved some of the long entries fairly early on: 7dn TATOUAYS (rev), 2dn EMISSARIES (rev) and 3dn GREAT BEAR. And so, for the next hour, almost without realising it, I concentrated on the left half of the grid. I made a conscious effort about this time, with about twenty (20) clues solved, to move to the bottom right and work my way up, on the basis that there were more answers going in reverse. 60ac CONNELLY (rev) and 27dn CORNELIANS (rev) started me off. Slowly the grid neared completion. It didn’t help that I misjudged the omitted letter at 49dn Ladies maybe long delayed boarding ship: I removed the E from SLATES to give LASTS rather than the T to give LASES. As a result, I thought the omitted letters spelt out something ending in …EOR rather than …TOR. Other parts of the message soon made it clear that we were looking for Nine film titles and their Director. Four (4) nanoseconds later, and I was writing HITCHCOCK, one of my cinema icons, in the isolated squares on the main diagonal. The title is a reference to his many brief cameo appearances in his films. I suppose Schadenfreude decided that the nine letters needed changing in order to disguise the titles somewhat, but in the process he must have made the grid ten times more difficult for himself given the requirement to make new words in the process. Phenominal! Just look at how many squares contribute to the theme! 22ac SNATHE A handle has what function when turning? Another tour de force from Schadenfreude, a tribute from one master to another. The state of affairs at 2 a.m.! Schadenfreude! The favourite compiler of a number of friends. We are sure that he will give us concise and perfectly fair clues and a real run for our money. 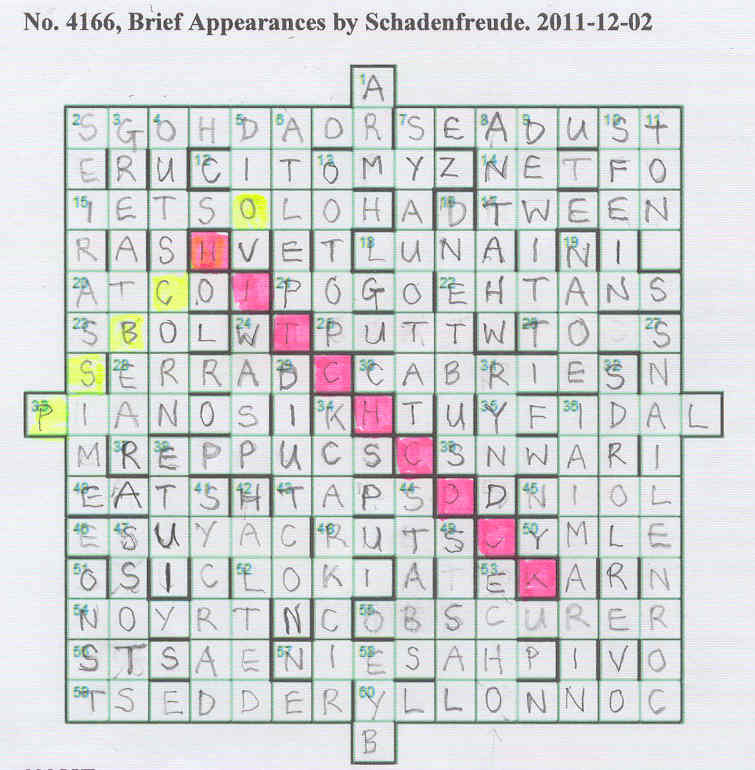 If we count those funny little ears, this is a 17X17 grid and there are 62 clues. There will be no Friday Club finish this week! We’re becoming old hands and that bit of the preamble that tells us that ‘For 22 clues, one letter must be removed from the answer and the residue used to form a new word for entry in the grid’ is not too daunting, as a quick check tells us that the word counts indicate which 22 clues those are. We highlight those. ‘Thirty-seven grid entries are written in reverse.’ Now that is slightly more disconcerting but it has to be there for a reason. We draw a strip alongside the clues, so that we can keep tabs on which clues are entered in reverse. We are lucky that words like EMISSARIES ‘Agents from Spain fail to meet stars (10)’ and CORNELIANS ‘Once out with Rex, slowcoach is climbing trees (10)’ are among the first we solve, and that we automatically put them into the grid in reverse, with LADIFY and HOLOSTEI following, so that soon we have our usual Numpty fill in the south-east corner of the grid and a fair smattering in the north-west. There is no denying it – this was hard work. 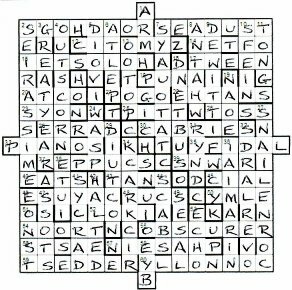 The forty normal clues soon formed a network but those 22 that had to produce extra letters really had us head scratching. Take 51d. ‘An expression of contempt could be not so bad (5)’ A quick check showed us that SNOOT (‘Not so’ anagrammed) was indeed an expression of contempt and TRY ON and REDDEST (if they were the right way round) established ?N?T in the grid. Did we need SNOT, or TONS? Fifteen minutes of dictionary search, of course, demonstrated that neither of those would do, as we entered the obscure ONST. And so it was in all four corners of the grid and the hours passed. What joy when that set of putative extra letters produced NINE ? ?LM TITLES D?REC?OR. So that was the reason for those nine squares running diagonally down the grid. A nine-letter director? DISNEY? EISENSTEIN? BERGMAN? 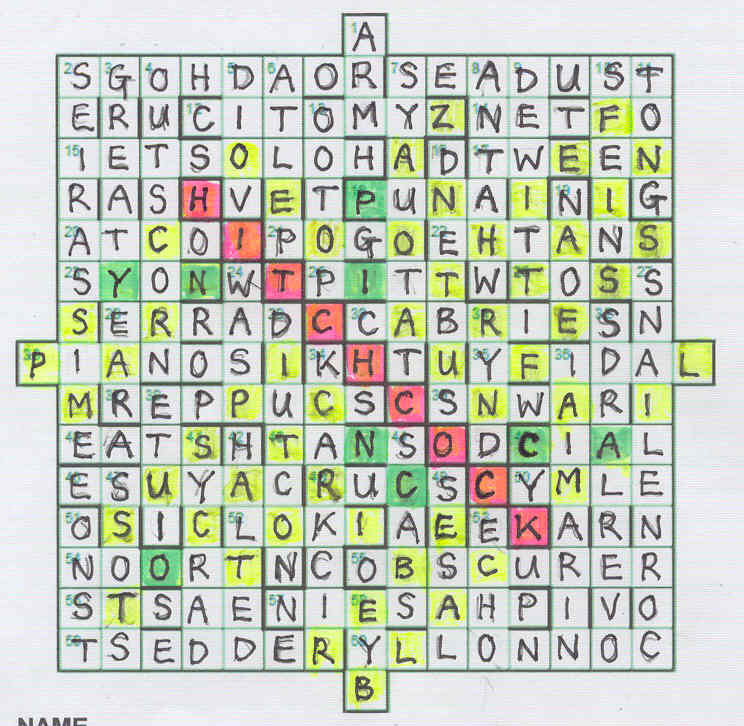 (At two a.m. even my letter counting is dodgy but this crossword was too enjoyable to put down – so near success!) SPIELBERG? (That’s nine) HITCHCOCK? I shall never forget that horrendous murder in the shower in Psycho. Sure enough, there is PSYCHO (with a letter change) climbing towards the H of Hitchcock. I slept on it, with a few squares to fill and more Hitchcock films to find. It wasn’t until day dawned that I saw the light and realized which Wiki site would produce brief appearances (yes, indeed, I forgot my own advice about examining the title carefully at the start!). Of course, these were the Hitchcock Cameos. The rest was easy, and, of course, finding titles like I CONFESS and REBECCA in the list of films where Hitchcock made his cameo appearances filled my empty squares. About seven hours of solid solving but how rewarding. There wasn’t even a silly hoop to leap up at in an impossible endgame. Thank you, Schadenfreude. This was a classic.